Daily Mail: "More than half of people who have been claiming incapacity benefit are 'fit for work'." Guardian: "Disability charities welcome increase increase in award of unconditional benefits." The Mail went on to specify that, according to the latest figures, 54% of people assessed could do some work while the other 46% were eligible for either the Support or Work-Related Activity (WRAG) groups of the benefit. Claimants in the Support Group are 'unconditional' recipients (as the Guardian describes them) and are not expected to work. It's a claim some readers may be wary of given problems Full Fact has highlighted in the past involving some papers redefining 'fit for work' as including recipients in the WRAG group when the Government's own definition makes clear this is not the case. Fortunately, that particular problem hasn't arisen here. The DWP statistics clearly state that of initial assessments conducted from December 2011 to February this year: "54 per cent of claimants were assessed as Fit for Work (FFW) and are no longer eligible for Employment and Support Allowance." Meanwhile, 20% of claimants starting their claim between these months were placed into the WRAG and 26% were placed in the Support Group. So the headlines are right then? Not so fast - this 54% only refers to claims between those months that have been completed, it doesn't include claims that are still undergoing assessment or who have had or are undergoing an appeal. 23% of the claims between December and February are still ongoing, and some of the 'fit for work' assessments will be subject to appeal. "Figures in this issue cannot reflect the final outcomes, because they do not include: 1. effect of appeals still lodged in the legal system; and 2. claims with no outcome yet recorded." 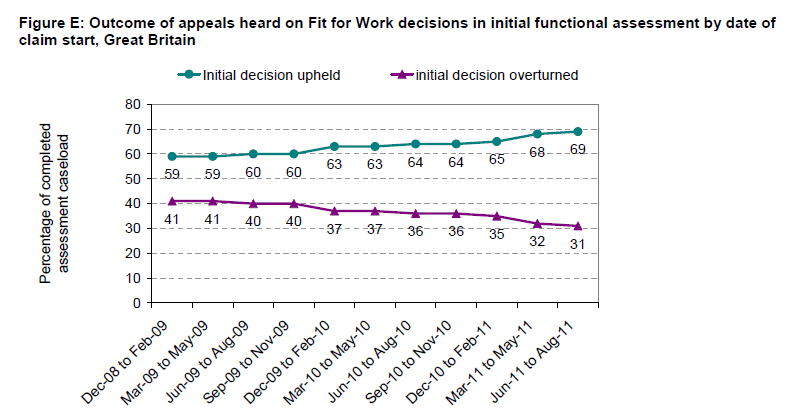 In other words, the 54% found fit to work is likely to overestimate the final number found fit for work after appeals have taken place and some have been overturned. 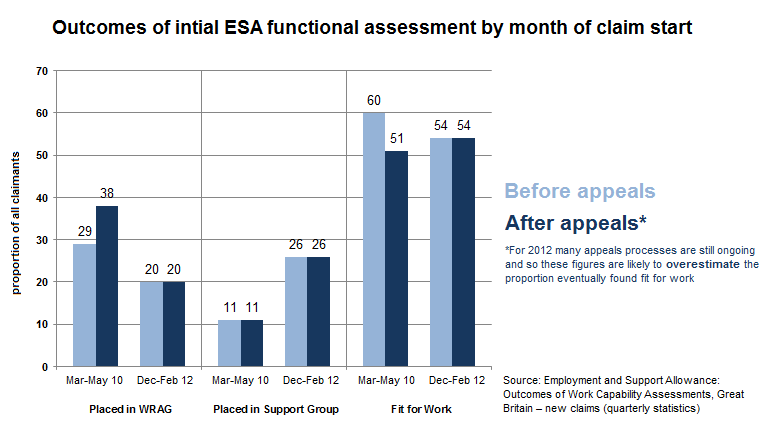 "An important reason why ESA claims in this sample were withdrawn or closed before they were fully assessed was because the person recovered and either returned to work, or claimed a benefit more appropriate to their situation"
Figures for reassessment have shown a far lower proportion of existing claimants being found fit for work. It's not strictly accurate to say that that more than half of people who have been claiming incapacity benefits are now being found fit for work as the figures don't provide direct evidence for this. Are there any figures that explain this? The DWP does publish some figures which include completed appeals, and these actually show the same proportions - 54% found fit for work, 20% in the WRAG and 26% in the Support Group. However, appeals tend to take a long time to resolve, and so it's too early to see how these figures will change once more appeals are complete. We shouldn't necessarily draw any conclusions from the apparent downward trend in overturned decisions. As the DWP repeatedly states, the more recent the data is the more likely it is to change. The 31% 'overturned' rate for June-August 2011 is based on only one in six appeals having been completed so far for this period. It's more revealing to look at initial assessments back at the time of the election and see how the outcomes changed after appeals were taken into account. The same can be done for the most recent period but, as we have mentioned, it's too soon to draw any comparisons as many appeals will still be ongoing. Here we can see evidence for the Guardian's claim that: "the percentage of new claimants receiving unconditional Employment and Support Allowance (ESA) payments has doubled since May 2010". The proportion of 'unconditional' recipients in the Support Group has more than doubled from 11% to 26% of initial assessments, and this is unlikely to alter a great deal after appeals are complete. What clearly is likely to change is the proportion found fit for work and the proportion placed into the WRAG. The graph shows that once a substantial number of appeals are complete we can expect the proportion placed in the WRAG to rise at the expense of the proportion found fit for work. For some, the Work Capability Assesment is a "deeply flawed" test and results continue to be the source of substantial controversy. Sticking to the figures alone, this morning's headlines quote the DWP statistics that show for the latest period, 54% of assessments for ESA found the claimant was fit for work. The Daily Mail's headline could be misread as meaning that more than half of existing ESA claimants have been reassessed as fit to work, when in fact the figures are just referring to new claimants, although the paper makes this clearer later in the article. This shouldn't be confused with what the eventual outcome will be, as we can expect something like a third of those decisions which are appealed to be overturned. This will reduce the number of claimants found fit for work and, combined with as yet missing information on claims that haven't yet been processed, could result in a different set of figures to the ones we've read this morning. One of our Twitter followers got in touch to point out that a substantial number (34%) of initial ESA claimants withdrew their application before completion as their health had improved or they had found another benefit. In addition, these statistics refer to new ESA claimants rather than reassessments, one reason why the fit for work proportion is higher here than in reassessment figures. This much has been clarified in the article. Are half of 'sickness benefit' claimants found fit finding work?